HomeChris Connor and The SteelsELVIS MANIA in Manila! ELVIS MANIA in Manila! A once-in-a-lifetime musical experience. Connor’s show highlights and recreates the King of Rock’s most memorable performances: 'That’s the Way It Is', Elvis’ 1970 Las Vegas performance that proved to be a turning point in his career—the time when he permanently abandoned movie roles and returned to the concert scene; and his 1972 sold-out Madison Square Garden Show, where he made his first-ever live appearance in the city and five years before his death. Witness Connor belt out classics from “Proud Mary,” “Can’t Help Falling in Love,” “Hound Dog” to “Blue Suede Shoes” in this rare occasion when the world’s most revered tribute act brings fans down to memory lane. The show is created by Elvis fans for Elvis fans. Its cast includes professional musicians, some of whom have played with renowned English pianist, bandleader, singer and composer Jools Holland and created music for television and teach music across the UK. The show boasts of the highest production value performance standards and guarantees to leave audiences speechless and transport them back in time. Connor has played in sold out shows across Europe—Ireland, Holland, the UK—Australia, and the United States—Atlanta, New Orleans, New York, and Elvis’ hometown, Memphis. Even Elvis’ own right hand man and close friend Joe Esposito has responded to him so enthusiastically after a performance in Memphis. If Elvis’ close friend says “Wow, that boy is good, damn he looks just like Elvis,” you simply have to see the act for yourself. 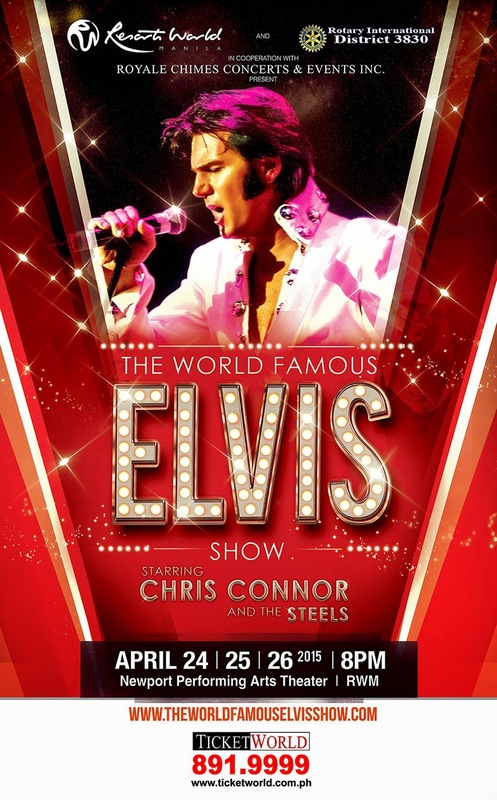 Chris Connor and The Steels concerts Elvis Presley resorts world manila Royal Chimes Concerts & Events Inc.